For other uses, see Hello (disambiguation). "You Mean More to Me"
"Hello" is a song by Lionel Richie. Taken as the third single from his second solo album Can't Slow Down, the song was released in 1984 and reached number one on three Billboard music charts: the pop chart (for two weeks), the R&B chart (for three weeks), and the adult contemporary chart (for six weeks). The song also went to number one in the UK Singles Chart for six weeks. The song later inspired a lawsuit by songwriter Marjorie Hoffman White, who accused Richie of plagiarizing her composition "I'm Not Ready to Go". The song is written in the key of A minor. The verses follow the chord progression of Am9—Cmaj7/G—Fmaj7—C6/G—Fmaj7. The chorus features a Neapolitan chord (Bb). The music video, directed by Bob Giraldi, features the story of Richie as a theater and acting teacher having a seemingly unrequited love for a blind student (Laura Carrington) until he discovers she shares the feeling as demonstrated by the discovery that she is sculpting a likeness of his head. The bust used in the video, which bears little resemblance to Richie, has been parodied in popular culture. Richie himself complained to the video's director, Bob Giraldi, that the bust did not look like him. Director Giraldi's response was "Lionel, she's blind..."
The song is memorable for the line "Hello, is it me you're looking for?" The phrase started the song's composition, as when James Anthony Carmichael visited Richie, the singer greeted him that way, to which Carmichael replied, "Finish that song." Richie initially felt that the song was "corny" but ultimately "by the time I finished the verse, I fell in love with the song again." The guitar solo on the song was played by session guitarist Louie Shelton. Kikki Danielsson recorded the song as "Du" ("You"), with lyrics in Swedish by Keith Almgren, on her 1985 album Bra vibrationer. In 2011, American bachata singer Berto La Voz covered the song which was released as the first single from his debut album Llego La Voz. This version peaked at #11 on the Billboard Tropical Songs chart. As a part of the tribute to Richie at the 58th Annual Grammy Awards on February 15, 2016, American singer Demi Lovato gave a rendition of the song. Her cover version eventually peaked at 15 on the Billboard Twitter Top Tracks chart. ^ "VH1's 40 Most Softsational Soft-Rock Songs". Stereogum. SpinMedia. May 31, 2007. Retrieved July 31, 2016. ^ Whitburn, Joel (2004). Top R&B/Hip-Hop Singles: 1942-2004. Record Research. p. 492. ^ Roberts, David (2006). British Hit Singles & Albums (19th ed.). London: Guinness World Records Limited. pp. 434–5. ISBN 1-904994-10-5. ^ "A Long Island song writer has filed a $1..." UPI. ^ "Unsupported Browser or Operating System". Musicnotes.com. Retrieved March 29, 2014. ^ Mathieson, Jack (May 23, 2014). "Student blindfolds himself as he bids to recreate famous Lionel Ritchie sculpture from 1984". dailyrecord. ^ Kiernan Maletsky and Gavin Cleaver. "Lionel Richie's "Hello" is the Most Confusing Music Video of All Time". Dallas Observer. ^ "Lionel Richie on Hits Tour, Commodores Reunion and the Legend of 'Hello' - Rolling Stone". Rolling Stone. ^ "Lionel Richie recalls early distaste for 'Hello' as hit song turns 30". CTVNews. ^ "Forum – ARIA Charts: Special Occasion Charts – CHART POSITIONS PRE 1989". Australian-charts.com. Hung Medien. Archived from the original on October 20, 2013. Retrieved August 27, 2016. ^ "Austriancharts.at – Lionel Richie – Hello" (in German). Ö3 Austria Top 40. Retrieved August 27, 2016. ^ "Ultratop.be – Lionel Richie – Hello" (in Dutch). Ultratop 50. Retrieved August 27, 2016. ^ "Radio 2 Top 30" (in Dutch). Top 30. Archived from the original on March 28, 2016. Retrieved August 27, 2016. ^ "Top RPM Singles: Issue 6741." RPM. Library and Archives Canada. Retrieved August 27, 2016. ^ "Top RPM Adult Contemporary: Issue 6748." RPM. Library and Archives Canada. Retrieved August 27, 2016. ^ "Lescharts.com – Lionel Richie – Hello" (in French). Les classement single. Retrieved August 27, 2016. ^ "Offiziellecharts.de – Lionel Richie – Hello". GfK Entertainment Charts. Retrieved August 27, 2016. ^ "The Irish Charts – Search Results – Lionel Richie". Irish Singles Chart. Retrieved August 27, 2016. ^ "Dutchcharts.nl – Lionel Richie – Hello" (in Dutch). Single Top 100. Retrieved August 27, 2016. ^ "Nederlandse Top 40 – week 15, 1984" (in Dutch). Dutch Top 40 Retrieved August 27, 2016. ^ "Charts.nz – Lionel Richie – Hello". Top 40 Singles. Retrieved August 27, 2016. ^ "Topp 20 Single uke 25, 1984 – VG-lista. Offisielle hitlister fra og med 1958" (in Norwegian). VG-lista. Retrieved August 27, 2016. ^ "Lista Przebojów Programu 3". LP3. Retrieved August 27, 2016. ^ "South African Rock Lists Website SA Charts 1965 – 1989 Acts R". The South African Rock Encyclopedia. Retrieved August 27, 2016. ^ "Swedishcharts.com – Lionel Richie – Hello". Singles Top 100. Retrieved August 27, 2016. ^ "Swisscharts.com – Lionel Richie – Hello". Swiss Singles Chart. Retrieved August 27, 2016. ^ "Official Singles Chart Top 100". Official Charts Company. Retrieved August 27, 2016. ^ "Lionel Richie Chart History (Hot 100)". Billboard. Retrieved August 27, 2016. ^ "Lionel Richie Chart History (Adult Contemporary)". Billboard. Retrieved August 27, 2016. ^ "Lionel Richie Chart History (Hot R&B/Hip-Hop Songs)". Billboard. Retrieved August 27, 2016. ^ "Forum – ARIA Charts: Special Occasion Charts – Top 100 Singles 1984". Australian-charts.com. Hung Medien. Archived from the original on December 31, 2016. Retrieved February 12, 2017. ^ "Jahreshitparade Singles 1984". Ö3 Austria Top 40 (in German). Retrieved August 27, 2016. ^ "Ultratop Jaaroverzichten 1984". Ultratop 50 (in Dutch). Retrieved August 27, 2016. ^ "Top RPM Singles: Issue 9638." RPM. Library and Archives Canada. Retrieved August 27, 2016. ^ "Top 100 Single-Jahrescharts 1984". GfK Entertainment Charts (in German). Retrieved August 27, 2016. ^ "Dutch Charts Jaaroverzichten Single 1984". Single Top 100 (in Dutch). Retrieved August 27, 2016. ^ "Top 100-Jaaroverzicht van 1984". Dutch Top 40 (in Dutch). Retrieved August 27, 2016. ^ "Schweizer Jahreshitparade 1984". Swiss Singles Chart (in German). Retrieved August 27, 2016. ^ "Volume 96 No. 51, December 22, 1984" (PDF). Billboard. New York, NY, USA. December 22, 1984. p. TA-19. Retrieved August 27, 2016. ^ "Volume 96 No. 51, December 22, 1984" (PDF). Billboard. New York, NY, USA. December 22, 1984. p. TA-25. Retrieved August 27, 2016. ^ "Volume 96 No. 51, December 22, 1984" (PDF). Billboard. New York, NY, USA. December 22, 1984. p. TA-21. Retrieved August 27, 2016. ^ "The CASH BOX Year-End Charts: 1984". Cash Box magazine. Archived from the original on September 30, 2012. Retrieved March 31, 2017. ^ Copsey, Rob (September 19, 2017). "The UK's Official Chart 'millionaires' revealed". Official Charts Company. Retrieved October 19, 2017. ^ "British single certifications – Lionel Richie – Hello". British Phonographic Industry. Select singles in the Format field. Select Gold in the Certification field. Type Hello in the "Search BPI Awards" field and then press Enter. 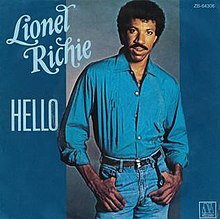 ^ "American single certifications – Lionel Richie – Hello". Recording Industry Association of America. If necessary, click Advanced, then click Format, then select Single, then click SEARCH. ^ "Bra vibrationer" (in Swedish). Swedish mediadatabase. 1985. Retrieved December 22, 2008. ^ "Llego La Voz - Berto La Voz". Allmusic. Rovi. Retrieved June 17, 2012. ^ "Latin Tropical Airplay 2011-12-31". Billboard. Prometheus Global Media. June 17, 2011. Retrieved December 31, 2012. ^ Robinson, Joanna (February 15, 2016). "Watch Demi Lovato Rock a Musical Tribute to Lionel Richie". Vanity Fair. Condé Nast. Retrieved April 5, 2016. ^ Ng, Philiana (February 15, 2016). "Demi Lovato Delivers Show-Stopping GRAMMYs Performance of 'Hello' During Lionel Richie Tribute". Entertainment Tonight. CBS Corporation. Retrieved April 5, 2016. ^ Bell, Crystal (February 15, 2016). "Demi Lovato's Fire Cover of Lionel Richie's 'Hello' Will Give You Chills". MTV News. MTV. Retrieved April 5, 2016. ^ "Billboard Twitter Top Tracks". Billboard. Prometheus Global Media. March 5, 2016. Retrieved April 5, 2016. This page was last edited on 14 March 2019, at 20:05 (UTC).